The Dana Brown Overnight Center is designed to accommodate a wide variety of groups. The overnight facilities can lodge school groups of up to 60 students and their teachers; adult and family programs may involve fewer numbers. Daytime usage can handle up to 100 participants. The Center includes four sleeping lodges, an assembly building and a shower house. All of the buildings are heated, air-conditioned, disabled accesible, and open year round. The lodges are historic log or post-and-beam buildings. The smallest sleeping lodge can house 14 people; the largest sleeps 19 comfortably. Most of the accommodations are dormitory style bunk beds, but there are some separate rooms available. A shower house with modern showers and restrooms is located within the complex. The Adlyne Freund Center can serve in conjunction with the Overnight Center as the dining hall for large groups. The Assembly Building and the Adlyne Freund Center are also available for day rental when overnight groups are not in session. Some of the unique features of this site include the use of salvaged materials during the construction and the Center’s septic system. This is a submerged flow wetland treatment system containing native Missouri aquatic plants, replacing the standard leach field. A campfire circle is located in the heart of the Center. The facilities are conveniently located within walking distance of the wetland, prairie, Meramec River and several trailheads—the extensive trail system of the Nature Reserve will keep your group hiking for hours. The diversity of habitats widens the scope of programming available to the Overnight Center and the computer lab capabilities in the Assembly Building allow students to record their field data before going back to school. 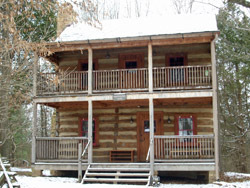 Sleeping Lodges: The four lodges are all of historic log or post and beam design. The comfortable bunk bed sleeping rooms are cozy and clean. Each lodge houses from 14 to 19 people in bunks and single beds. Separate rooms are available for teachers. All four lodges contain a gathering room and a half bath. Use the large porches for reading, bird watching or just relaxing—each one commands a beautiful view of the natural area around the Center. The Adlyne Freund Center was originally built as a hunting cabin by David P. Wohl, owner of the Wohl Shoe Company. Using stone quarried and oak logs cut from the property, the lodge was completed in 1932. This rustic lodge is used for a variety of programs, including teacher training workshops and conferences. In conjunction with the Dana Brown Overnight Center, the Adlyne Freund Center can serve as the dining hall. Groups may also rent the building for other special functions when overnight groups are not in session. Amenities: The Adlyne Freund Center can seat up to 60 people. Round and/or rectangular tables, plus chairs are available. The building contains a fully equipped small commercial kitchen, two bathrooms, a large fireplace and a small projection screen. The large, glassed-in back porch may be closed off for a separate meeting area. The covered outside porch commands an excellent view of the Meramec River Valley. Amenities: This large post and beam building offers a spacious open area for large group gatherings of up to 100 people seated lecture style. Round and/or rectangular tables can seat between 60 and 75 people. An oversized screen is available for slide, PowerPoint or video presentations. A small kitchen is fully equipped with a stove, refrigerator, dishwasher and microwave. For more intimate gatherings, seating may be arranged around the large fireplace downstairs. Upstairs is a loft, which can be used for small group activities, with a smaller fireplace. There are two bathrooms in the building. Oversized windows and a wrap-around porch provide excellent views of the Dana Brown compound and the forest beyond. Construction: This reconstructed barn was originally located on a farm. The front porch posts were constructed from cedar that was removed during the glade restoration project at Shaw Nature Reserve. The cypress wood porch flooring came from ammunition tanks in Louisville, Kentucky. The exterior door was made from Norway spruce trees removed from the wetland at SNR. The fireplace is sandstone and the mantel stone (or lintel) is one large stone—all were hand-cut and came from West Virginia. The flooring was constructed out of old school bleachers. The cabinets in the kitchen and office areas and the staircase rails were made from oak trees that were dead or blown down at the Reserve. The staircase was constructed with lumber reclaimed from an old house. The bricks in the entrance patio were salvaged from the Polar Ice Company in St. Louis. Original location: Southeast of New Haven, 30 miles west of Gray Summit. Amenities: This lodge is especially suited for small groups of 19 or fewer. Inside are three sleeping rooms each accommodating five or six people in bunks or single beds, plus another room for chaperones. There is a half bathroom located on the first floor. A gathering room downstairs provides an intimate area for talking, reading or just relaxing. Enjoy the spacious view of the compound and forest beyond from any one of three porches, one upstairs and two downstairs. Construction: The front porch posts and the beams above the porches were made from cedar trees harvested during the Shaw Nature Reserve glade restoration. The porch flooring and the windows were constructed out of cypress wood from ammunition tanks in Louisville, Kentucky, circa early 1900s. The front and upstairs fireplaces, their mantels, and all the beams are originals. The flooring had been old shelving obtained from the Rexall Drug Store located in St. Louis. The doors were made from white pine from old buildings in St. Louis. The brick walkway outside the lodge was from the Polar Ice Company in St. Louis. Amenities: This lodge has beds for up to 19 people, 16 of which are upstairs in a dormitory style arrangement of bunks. There is an additional bedroom downstairs for three adults. A comfortable gathering room on the first floor provides space for talking, reading or just relaxing. Also located downstairs is a half bathroom. A wrap-around porch with an inspiring view has a staircase off the back for access to the woods behind. Construction: The Lee Lodge and Casa Audlon Lodge came from the same property. A German immigrant, Breckenkamp, built the buildings. The family lived on the homestead until the last member of the family passed away in 1995. The original workmanship on the Lee Lodge has been described as “phenomenal.” The walnut front doors and doorjambs are original from the time of the Breckenkamps. The cedar porch railings and posts were from the glade restoration project at Shaw Nature Reserve. The cypress flooring was from ammunition tanks in Louisville, Kentucky. Amenities: This lodge will comfortably sleep 14 people. Thirteen beds are upstairs in a dormitory style arrangement of bunks. An additional single bed is located downstairs. A large gathering room allows plenty of space for relaxing, playing games or reading, but can double as a sleeping room for two. Also on the first floor is a half bathroom. 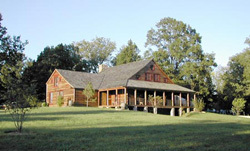 Two covered porches on the front of the cabin—one upstairs and one downstairs—provide a spacious view of the compound. This is the only lodge not handicapped accessible. Construction: The posts on the front porch and the beams above the porch were made from cedar trees cut during the Shaw Nature Reserve glade restoration project. The porch flooring and the windows were constructed out of cypress wood from ammunition tanks in Louisville, Kentucky, circa early 1900s. All of the inside doors came from white pine that was reclaimed from old buildings in St. Louis. The interior flooring was shelving that came from the Rexall Drug Warehouse in St. Louis. The bricks for the walkway outside the lodge were salvaged from Polar Ice Company in St. Louis. Amenities: This lodge has a dormitory style arrangement of bunks that can accomodate 16 people. There are 14 bunkbeds upstairs, and an additional bedroom for two downstairs. A spacious meeting room with a fireplace suitable for informal gatherings has access to both the front and back porches. A half bathroom is also on the first floor. 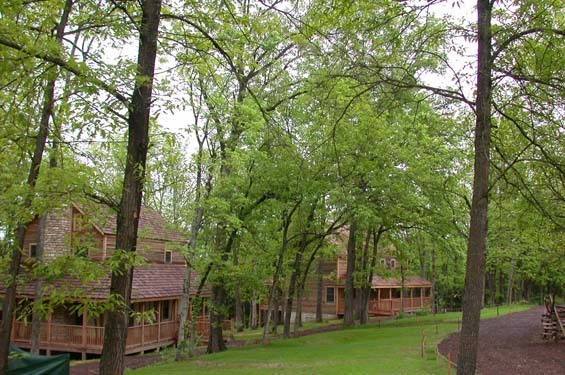 The back porch provides a relaxing view of the forest behind the lodge. A full view of the Dana Brown compound can be seen from the front porch. Construction: Casa Audlon Lodge was the Breckenkamp Family barn. This barn was a large size not normally seen in Missouri. The porch is constructed of cedar flooring and railings milled from trees taken down during the Shaw Nature Reserve glade restoration project. The siding is reclaimed redwood from a water tank. Designed in the Rumsford style, the fireplace has a narrow and shallow firebox and angles to reflect the heat back in to the room. The floor joists are oak replica that had to be added because there was no second floor in the barn; the upstairs was actually a hayloft. The shower house is a modern building with several amenities including showers, sinks, restrooms and radiant floor heating. This bright, spacious facility includes privacy rooms connected to each shower stall.